The December 2009 Daring Bakers’ challenge was brought to you by Anna of Very Small Anna and Y of Lemonpi. 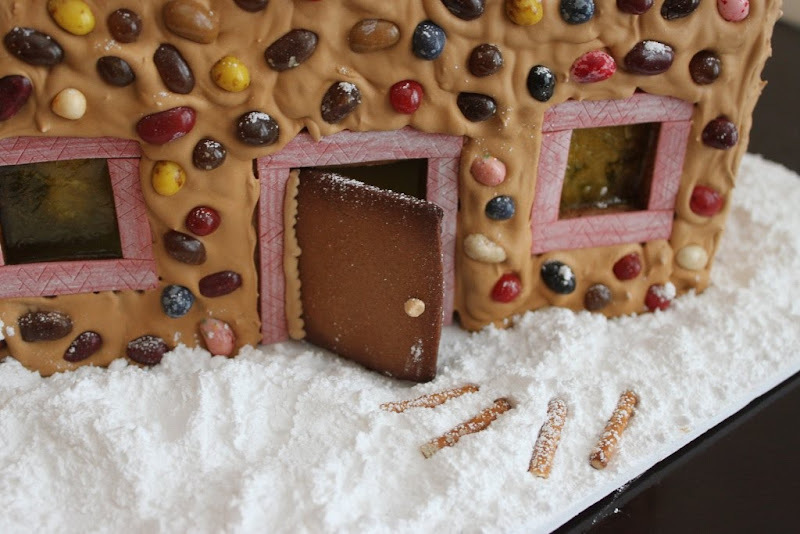 They chose to challenge Daring Bakers everywhere to bake and assemble a Gingerbread house from scratch. They chose recipes from Good Housekeeping and from The Great Scandinavian Baking Book as the challenge recipes. I have never made a Gingerbread House before and this was hands down the most fun challenge for me. Since I was out of town for most part of this month, I didn’t quite get a chance to start on my Gingerbread House until this week. I was almost not going to make it but the experience of baking and decorating a Gingerbread house from scratch was just too tempting to resist. We were allowed to choose any theme for our GB house as long as we used the given recipes. I chose to use Anna’s recipe which is from Good Housekeeping. 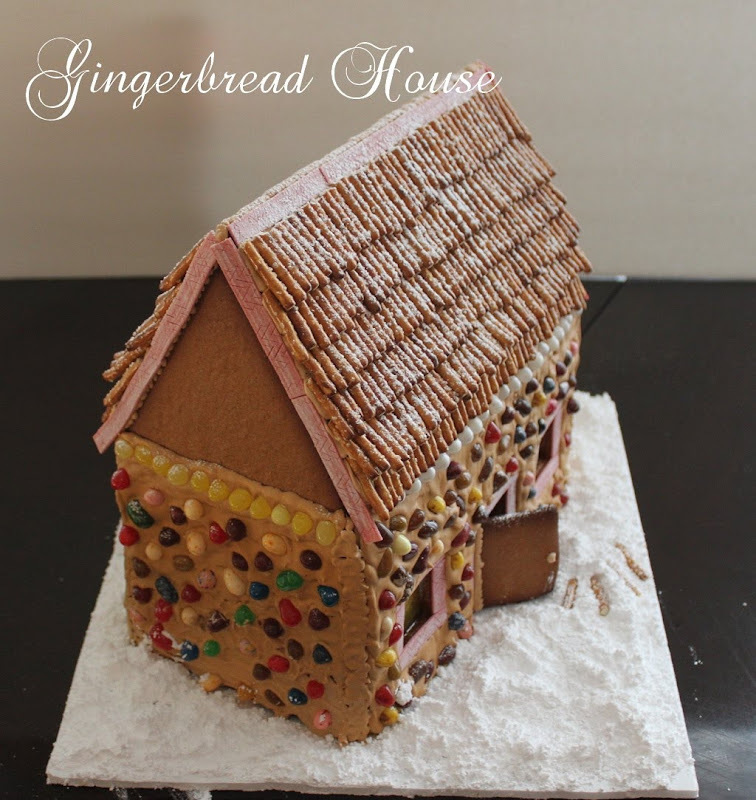 I made a Ginger Bread Stone Cottage using my own template. I used Wilton’s Royal Icing recipe to keep the house in place and candy for decoration. I halved the recipe which was just right for the template I used. 9. Bake 25 to 30 minutes, until pieces are firm to the touch. Do not over bake; pieces will be too crisp to trim to proper size. Beat all ingredients until icing forms peaks (7-10 minutes at low speed with a heavy-duty mixer, 10-12 minutes at high speed with a hand-held mixer). Cover mixer with a damp cloth to prevent icing from crusting. Store remaining icing in an airtight container, do not refrigerate. NOTE: Keep all utensils completely grease-free for proper icing consistency. Tint the icing using icing gel color to match the color of the gingerbread pieces. STEP 1: House Base Fill a piping bag fitted with a #3 tip with 1 1⁄2 cups of royal icing. Pipe icing along both edges of one side wall and join it to one end of both the front and back walls. Press to create a tight seal. Place a heavy aluminum can (such as beans or soup) along the inside and outside of each wall to provide support. Pipe icing along both edges of the remaining side wall and adhere it to the opposite ends of the front and back wall to form a rectangular box. Pipe icing along the inside joints and along the base to help ensure that the connections are secure. Place heavyweight aluminum cans against the house sides--both inside and outside the box--to support the structure while it dries. Allow to dry completely (at least 3 hours). STEP 2 Roof: Pipe a thick line of royal icing along the top edge of one roof piece. Secure it to the top edge of the other roof piece so that an “A” is formed. The distance between the base of the edges should measure about 5 inches. Stand the connected pieces on end on a piece of parchment or waxed paper. Pipe icing along the inside joint to add extra support to the connection; and place heavy aluminum cans against the pieces to provide support while the icing dries (at least 3 hours). STEP 3 Decorating: Everything must be completely dry before beginning this step. Place the roof on top of the house base. Windows: The gingerbread pieces have to be cool and hardened before you try to make the windows, so bake these pieces first. By the time you are done baking the rest of the pieces, these would have cooled down. Line a cookie sheet with foil. Place the side portions (the ones with windows) of the Ginger bread house on the cookie sheet. Pulverize hard candy (I used yellow candy) in a Ziploc bag by hitting hard with a rolling pin. Spoon candy pieces into window openings. Place in the oven for about 2 minutes until the candy melts, do not let it bubble up. Remove and let cool completely- about an hour. Slowly peel off foil from pieces. Now you have candy windows. 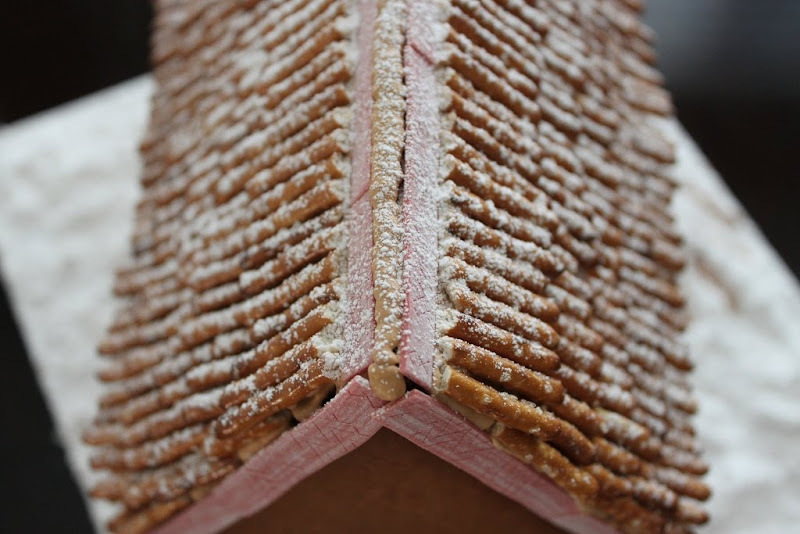 Mortar: Royal icing is the "glue" that holds the gingerbread house pieces together and the embellishments in place. I am glad I made the Gingerbread House. Thanks Y and Anna for a fun challenge! I'm glad you enjoyed it! Your house looks amazing =D. I love the jelly beans - they add a great esthetic! Ginger house looks AMAZING..Love everything on it..Reminds me of 'Halli Manes' back home. My fav part is the pretzel roof.. looks so perfect. YOu are very talanted Nams.. 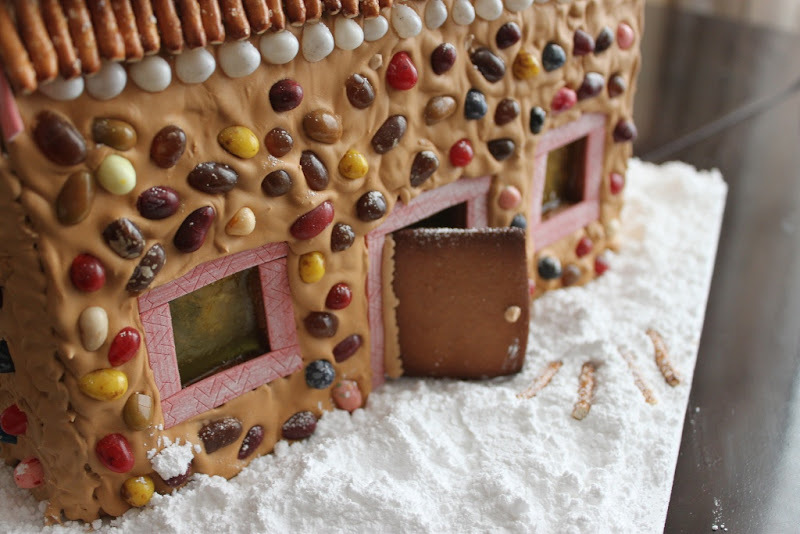 Your ginger breadhouse looks great!!!! 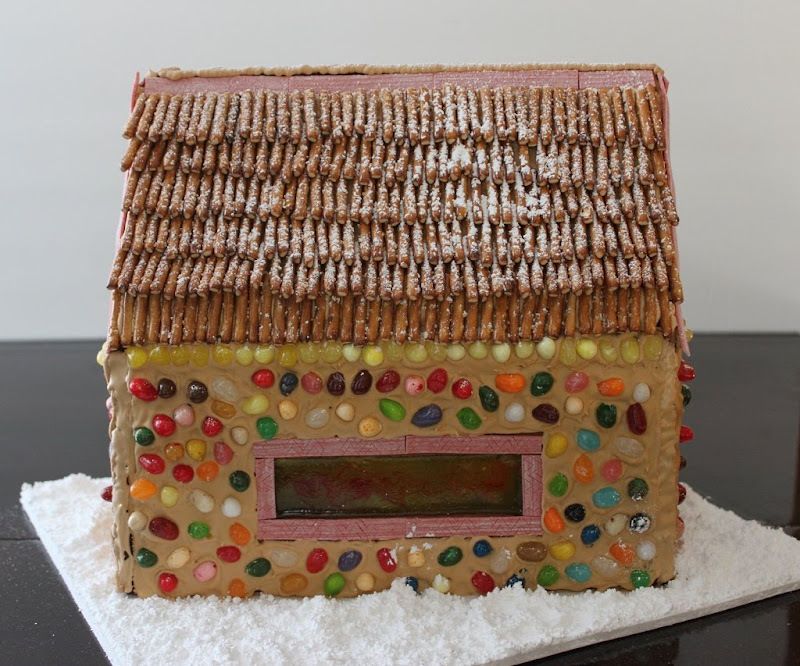 Wow - I'm not a Daring Baker (yet ;-)), but this is amazing, I love your roof - it's architecturally perfect! very beautiful. You are very talented Nams. what a lovely house you made! One of the best ginger bread houses I have seen...looks really gr8.. Your stone cottage is truly pretty. Looks like just thing to live in. Wow, I love the decorations and the roof. It's adorable! Your roof is absolutely perfect! Happy New Year. Beautiful! This is quite possibly the most creative approach at decorating the walls and roof I've ever seen- Bravo! One of the prettiest GB houses in the challenge! 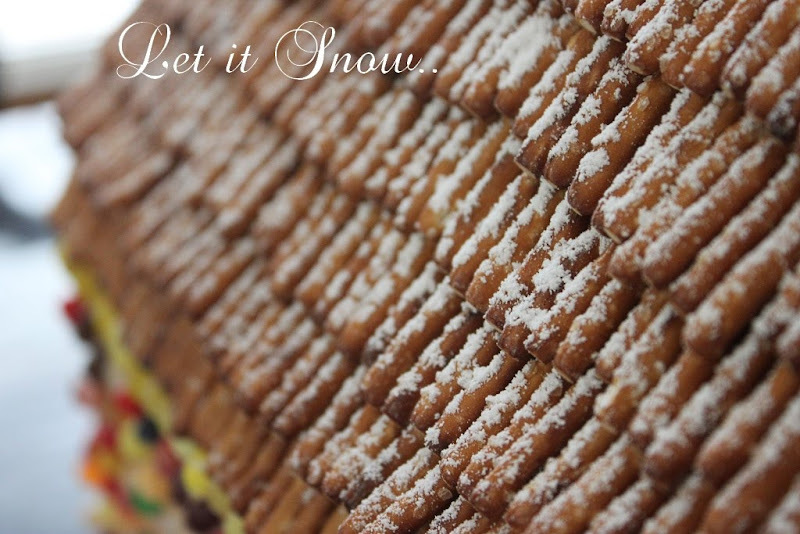 I can't believe you painstakingly placed all those pretzel sticks toegther on the roof, but it sure paid off - it looks incredible. I wish I had used jelly beans for my mosaic walls instead of ordering 5 lbs of chocorocks...ACK! Happy New Year!!! Simply Superb -- this are really beautiful! I remember making a chocolate house with my mom as a kid. What beautiful memories these are, and you have great pictures to go with that! I really love the beautiful decoration and the roof and the stones in the wall! wow your ginger bread house looks amazing.Very innovative.